Don't Walk Through the Brick Door. What happens when you run into a brick wall, figuratively speaking of course? You go get the key. And if that key eventually takes you to an alternate reality - a parallel universe, ghosts, ghouls, a twilight zone? Where you have a new set of parents wanting to give more tender, loving care your real parents will not, or cannot, but which would cost you your heart and soul, for all eternity? Can you get to keep your soul and get your real parents back? That, in short, is the premise of this creepily darkish short novel for kids. Coraline is a precocious kid who almost everyone insists on calling Caroline, who lives with her loving but preoccupied parents in a huge house. So huge, in fact, that it has been divided into multiple houses, occupied by interesting characters for sure. There is an old man who is trying to train mice for a circus show, and who have a message for Coraline - they are the only ones in the house, apart from her parents, who seem to get her name right, and there are two retired stage actresses who think of their days of glory long gone and reading tea leaves to tell the fortune and fate of anyone walking through their door. So one day, Coraline is thoroughly bored because it has been raining outside, and takes up her father's advice to go counting. Counting things like the number of windows in the house, the number of doors in the house, and finds that one door is locked and blocked. Her mother even shows her that. Till it is no longer bricked and blocked, and Coraline walks through the door one day when her parents are not in the house. There are parents in the other house, where her other mother has buttons for eyes, and her nails are just that longer than normal, and her other mother wants to keep Coraline in the other house. Except that she cannot, because of something in Coraline's pocket. Coraline's real parents, on the other hand, have gone missing. Or have they? Can Coraline find her parents, and get away from her seriously creepy and scary other parents. Neil Gaiman has written a dark and gripping story that may not be suitable for all eight year olds. Adults will however love the book. The book reminded me at least a little bit of Roald Dahl's books. Yes, almost all of them are seriously creepy, especially "The Witches". This book ratchets up creepy just a little notch more. 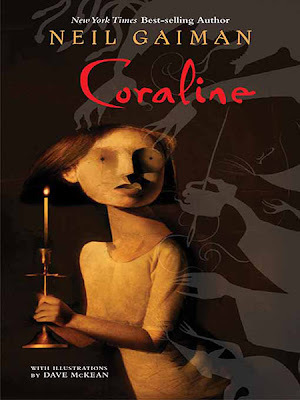 Coraline is one tough nut who is brave - read the book to find out!